Please scroll to page 4 to see the most recent updates. Those who know Ronnie know his cars not light. and hes not about to do anything about it either. this is a true 100% full weight evo with all the luxury. AC, in dash touch screen dvd, leather seats, leather door panels, leather everything. this car lacks nothing luxury and is super clean inside and out. That said, with Ronnie in it the car weighs in at 3600lbs right on the nose. Car drives like stock, and runs WOT like a race car. best of both worlds in this evo. We are not trying to extract 100% full power out of this car unless we put it on a dyno and closely monitor the gains per timing added. so for now i will call this a "conservative" tune. Here's video of the 10.11 pass and i got another vid of him with a slower pass also that day. keep in mind boost pressure was down another 2psi then it was at night when we were tuning around 3-4am in 50F temps. heres my footage i took with my D7000 - I had sunscreen in my eyes so it was like a idiot trying to work a camera, so don't pay it any mind i didn't focus it properly. As you can see car has a 9 hiding in it as is even at 3600lb with better 60ft! Last edited by tscompusa; Oct 10, 2014 at 11:24 AM. This thing will have 9s in it this season. 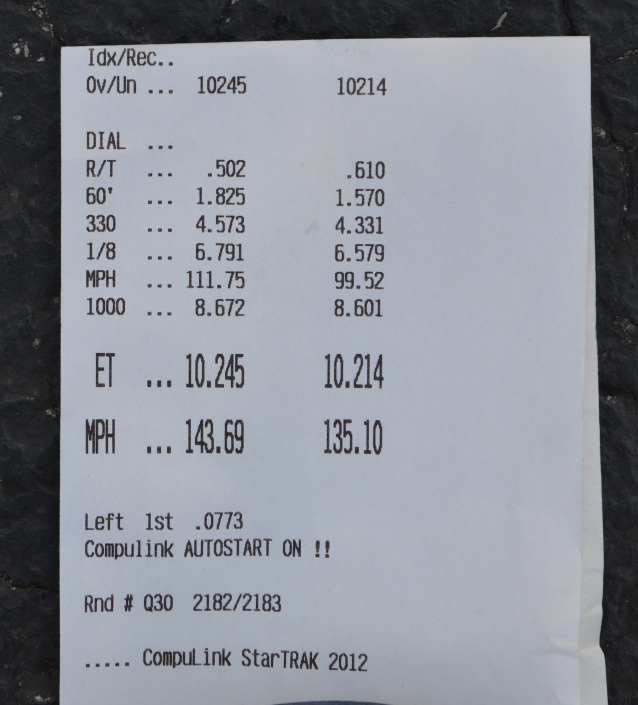 Not bad for my first time out on the setup with e85. Thanks again Tom for the late night road tune. Ronnie good hanging! I went in his car the car deff moves that for sure! Ronnie is def one of the better drivers at the shootout for sure just thought id throw that out there. No problem Ronnie! Was fun hanging out with you. yep Ronnies car is very fast. 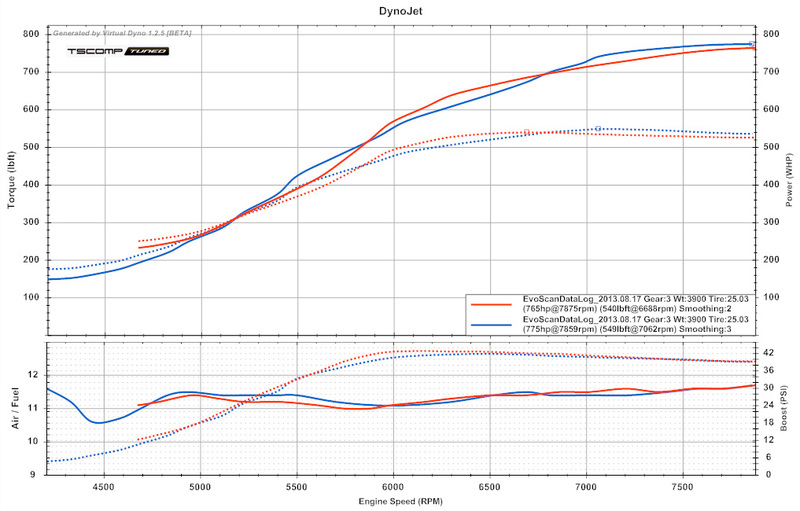 It was running less boost down the track also due to temp and rpm being launched and so forth at the track. And yes Ronnie is a driver mod big time. he can shift super fast. guys seems you know what you´re doing! very interested in your services. great driving and beautiful car! wow nice car! i have to ask what lip do you have on your car ronnie? 3600lbs 10.1 imagine 3000lbs easy 9.5 car! 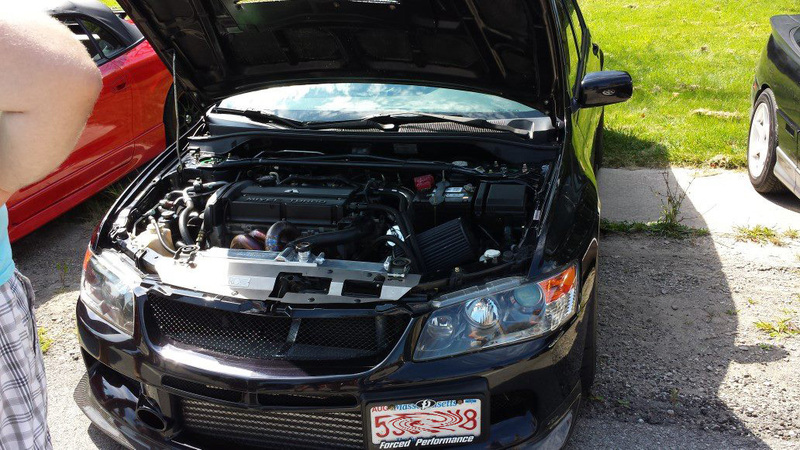 The lip is a ralliart replica that came with the car. I saw this car in person. Very nice car with great end results! Awsome #'s all around. Need a ride bro when I come to Springfield. Thanks guys. Ronnie is good at wrenching cars for sure and his evo is built very well and it was easy to make power with it. what clutch does this car have?